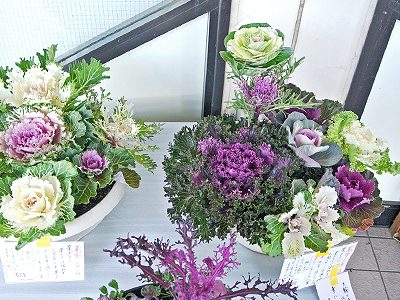 Ornamental cabbages, common feature of the New Year. NOT for eating! Toyotomi used to be famous for sericulture, producing raw silk. 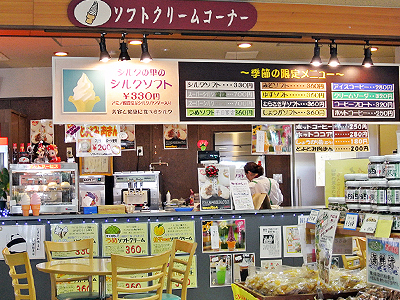 At Michi-no-Eki ‘Toyotomi’, wide variety of products related to silk are available including silk soft-served ice cream! 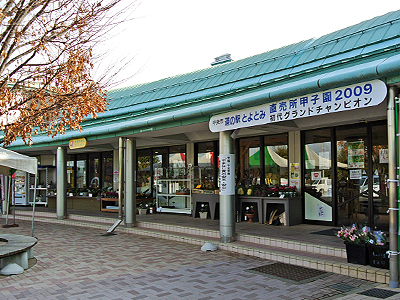 The place is one of the best recommendable ‘Michi-no-Eki’ in Yamanashi prefecture to look or buy products originated to Yamanashi and Toyotomi district. 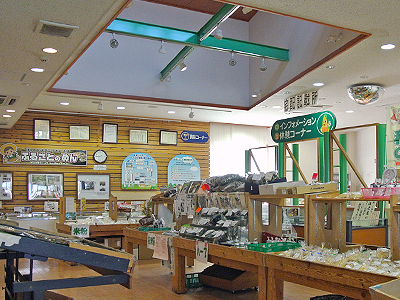 The shop was awarded First Prize in the ‘Michi-no-EKi Grandprix Award’ in the past which you’d clearly come to feel when you enter the shop and see the products on the display. They have been working hard on collecting and propelling farmers and producers of the district to invent and provide products that are specialized in their ingredients and cultural basis. Winning awards displayed on their wall! Soft-served icecream booth serving ‘Silk’ icecream! They also have other flavours. You can see that one of their principal products of the area are tomatoes which are also cultivated widely in Japan but what they did to differentiate their tomatoes was to cleave to their original cultivating method, made new type of tomatoes that no other places could copy. For such efforts, the value of their tomatoes, Pomodia, has become high that the price of a tomato is not what we usually resemble as the price of it but if you have plenty of money to spare, buy and eat some! We are sure it will be a good topic for you to talk when you get back home and speak about the great tomatoes to your friends. “Pomodia” tomatos. Photo from Chuo-shi Chamber of Commerce & Industry Youth Division Official Site. 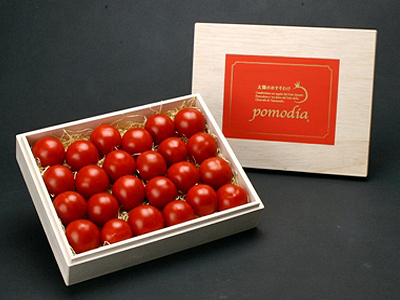 “Pomodia” in gift box. Photo from Chuo-shi Chamber of Commerce & Industry Youth Division Official Site. Of course, most of the products that they have worked on are in reasonable price. 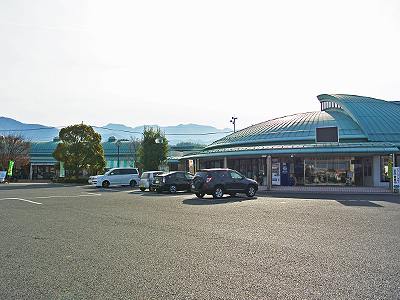 Local farmers bring fresh vegetables and fruits picked on the very day of the season and locally grown pork, ‘Fujizakura Pork’ is available here. They process this Pork within the Michi-no-Eki building into ham and bacon which are vacuumed packed so that you can take back easily. Suitable to take them to hiking and trekking in the surrounding mountain area. Ought to try! The best season to come here is at the time of harvest but throughout the year, there are things which would interest you and most of them are what you don’t see much in other places. 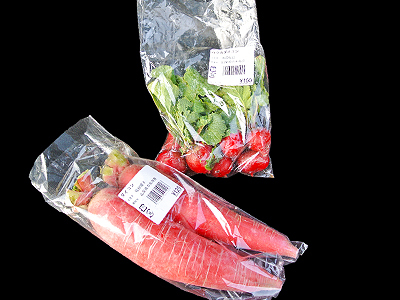 Various crops of the season are sold in reasonable price! Fresh vegetables packed and sold. Processing ham, sausages and bacon of ‘Fujizakura Pork’ done here. 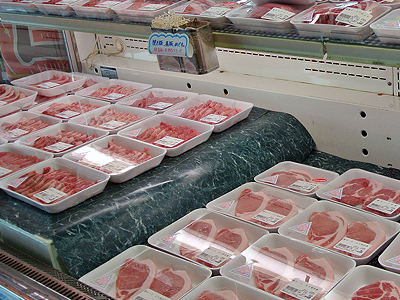 Fresh ‘Fujizakura Pork’ cut and packed. Powdered (of course EDIBLE!) silk is mixed within the ice cream! We tasted it and didn’t realize something that is thought to be ‘silk’ (… mind you, we don’t know what silk actually tastes like), still, the combination of vanilla and fresh milk tasted really good! Apart form this ‘Silk’ soft-served ice cream (in cone), there are varieties of seasonal vegetables and fruits of the district such as, pumpkin, grapes, peaches, etc., in total of 17 flavours are available. 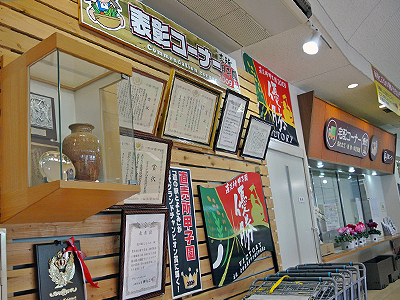 As other places in Yamanashi prefecture, this area is also famous for the corn cultivation and the wide variety of corn-related products are worthy of remark, such as corn wine, corn liquors and corn candies! Simply boiled corns for you to take-out which has a good well-sweet taste are also available in season. As mentioned above, this area is famous for tomato cultivation. 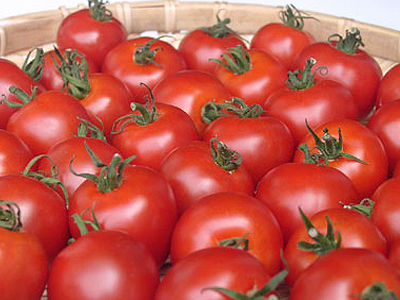 There are lots of tomato related products other than special price tomatoes. The particular local dish is “Tomato YakisobaW”, fried noodles with tomato sauce! Yakisoba is a well-known casual dish here in Japan, normally noodles fried in a pan with brown sauce. The brown sauce’s origin is the Worcestershire sauce of those from Britain but has evolved originally in Japan through these 120 years, called ‘Sosu’. But in this area, they use tomato sauce (of course, with the local tomatoes) instead of ‘Sosu’. 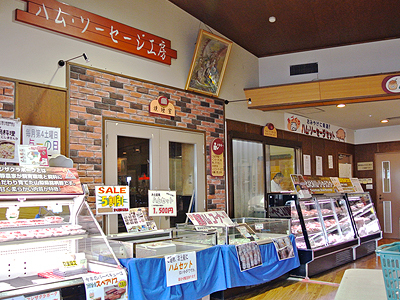 You will never be able to try this Yakisoba outside this area, Chuo-shi, so if you are curious, don’t hesitate to try! Address : 1010-1 Asari, Chuou-shi, YAMANASHI Pref.